Rails 5 tutorial chat app - can we deploy it to AWS? The simple chat example that DHH built in his recent screencast using ActionCable in Rails 5, is available on GitHub here: https://github.com/HectorPerez/chat-in-rails5. 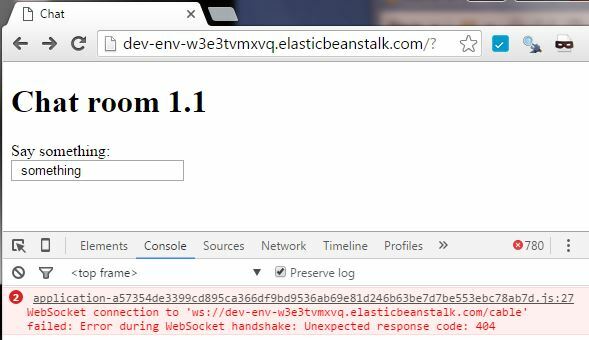 But can we get this working on an Elastic Beanstalk single instance - with no load balancer ? => Initially yes, then no, then yes! Now when we give it a try - it works! Now when we give it a try - it doesn’t work! A fresh deploy no longer worked! But when we SSH to the server and take a look: it hasn’t run and we don’t see the script in the folder. The deployment log showed no indication of the file being there. Meanwhile to get this working we spun up a single instance with a very short environment name: ‘env1’ instead of ‘dev-env’. Fortunately this made the whole server name short enough to avoid the ‘nginx: could not build the server_names_hash…’ error.